Seagate Technology has announced local availability of the LaCie® DJI Copilot amongst a range of new storage devices designed to equip the world’s increasingly mobile population with solutions that solve key challenges they face when creating, processing and accessing their data on-the-go. Designed to maximise drive performance and equipped with flash-speed function up to 560MB/s and 90K IOPs that accelerates boost-time, file transfers and application loading, the BarraCuda SSD provides the desired capabilities for nearly every compute need. Offering best-in-class versatility, the multiple capacity options and a standard 2.5” form factor with SATA 6Gb/s interface enable users to easily integrate into most laptops and desktop PCs. Optimised for maximum capacity and equipped with ultra-low power mode support for reduced power consumption, performance seekers can rest assured that the BarraCuda SSD will deliver exceptional quality and desired performance. Plus, the peace of mind comes with a 5-year warranty, 1.8M hrs. MTBF, up to 1092 TBW with 24-hr Global Technical Support. 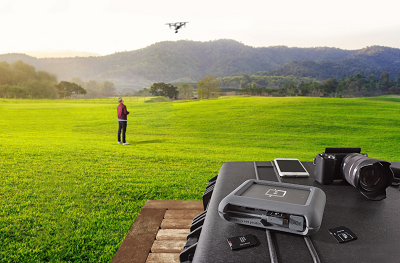 Videographers who want to capture footage in the field can now streamline their on-set workflow thanks to LaCie® DJI Copilot, the second product offering from Seagate’s strategic partnership with DJI, the world’s leading manufacturer of unmanned aerial vehicles. With design by Neil Poulton, the LaCie DJI Copilot is a complete backup on-set solution – enabling drone users to quickly ingest and review their content in full resolution without a PC. This changes the game by allowing users to playback, copy and manage their drone footage from the Copilot BOSS (Back-up On-Set Solution) app by LaCie on their mobile device without the hassle of leaving the field or booting up a computer. Users can also quickly connect and reference the built-in screen to initiate direct file transfer from an SD card to LaCie DJI Copilot – without the need of a laptop or a mobile network. The built-in power bank also allows creative professionals and consumers to recharge their mobile devices on the go. With 2TB of storage, the LaCie DJI Copilot enables users to easily store up to 60 hours of 4K 30fps video footage and 20K+ RAW photos. It is available now in Australia with an RRP of AU$549.95. Encased in the famous orange rubber shell, the LaCie Rugged® RAID Pro offers up to 240 MB/s in RAID 0 and RAID 1 for peace-of-mind in having a second copy in the field, as well as when transporting content back to the studio. With the new integrated SD Card Reader, creative professionals can quickly offload content with the quick import toolkit. The Rugged RAID Pro is designed with the latest USB-C connector and is compatible with next-generation Thunderbolt 3 computers but also backward compatible with USB 3.0. While the drive is also shock, dust, crush and water resistant, LaCie includes 3-Year Limited Warranty with Rescue Data Recovery Services and 1-Month Adobe All-Apps Plan – featuring Adobe Photoshop CC, Adobe Illustrator CC and much more giving creative professionals peace of mind when exploring and capturing the world. The LaCie Rugged RAID Pro 4TB is now available in Australia with an RRP of AU$549.95. Data security is one more growing concern for anyone using a mobile device. To address this challenge, Seagate introduced LaCie Rugged® Secure, the first Rugged drive to include hardware encryption using Seagate Secure™ technology. Built to withstand all-terrain extreme conditions from photo shoots in sub-zero temperatures to repeated drops on hard studio floors, the Rugged Secure, with design by Neil Poulton, gives users peace of mind that they can control access to their content. A simple disconnection of Rugged Secure from a computer will automatically lock the drive and access to the data stored and will remain password-protected via new Toolkit software. The LaCie Rugged Secure 2TB is available in Australia with an RRP of AU$219.95. Seagate® Fast SSD offers on-the-go consumers an ultra-portable flash drive that teams fast performance of up to 540MB/s transfer rates, with shock-resistance and USB-C connectivity as well as backwards compatibility. Users can backup or sync their content using Seagate’s new Toolkit software. Seagate Fast SSD will be available in Australia at leading retailers from September. The RRP of 250GB, 500GB and 1TB capacities is AU$189, AU$269 and AU$569 respectively.